When you’re setting up Spaces in OS X 10.5, one of the more time-consuming aspects of the process is assigning your programs to each space. Assigning a program to a space is done in the Spaces tab of the Exposé & Spaces System Preferences panel. Typically, to add a program to a space, you’d click the plus sign, navigate to the Applications folder in the window that appears, click the program you’d like to add, and then click the Add button. But what if you have a lot of programs to add? Here are a couple tricks to make adding multiple programs much simpler. 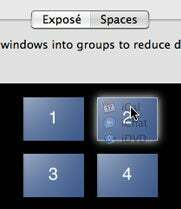 First, if you’re using the plus-sign method, realize that you can hold down the Command key to select more than one program at a time. Just press and hold Command, click each program that you’d like to assign to a given space, then click Add. Even easier, though, is to skip the plus sign method altogether. Instead, open your Applications folder in the Finder, and position the window such that you can see it and the Spaces tab of the Exposé & Spaces System Preferences panel at the same time. Select a number of apps in the Finder—you can use the usual Shift and/or Command key modifiers for multiple selections—then drag and drop them directly onto the visual thumbnail of the space you’d like to assign them to (as seen in the image at left) in the Spaces System Preferences panel. Using either of these methods is much quicker than assigning programs one at a time. I especially like the second method, as it’s the best way to assign more than one app to a given space—and the white highlight visual cue makes it easy to see exactly where the dropped programs will be assigned.